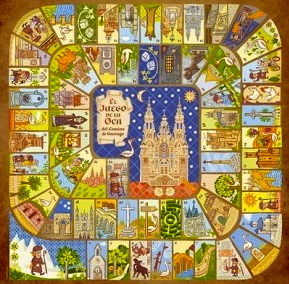 El Juego De La Oca is another wonderful surprise and new experience of discovery along The Way of Saint James adding to the mystery and the history that makes the Camino so unique. Have fun seeing what you will learn and uncover of the hidden treasures and secrets of Galicia and the Camino!!! This entry was posted in Camino Treasures and tagged camino, culture, games, history, Inspiration, nature, outdoors, spirituality, The Way, traditions. Bookmark the permalink.